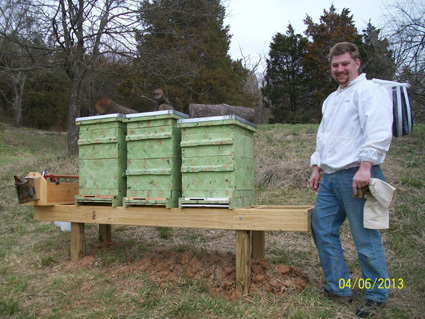 Our bees live in Eureka Missouri, about 20 minutes south of St. Louis. We have a total of (8) hives. We have hives at my house in Eureka, at my parent's house in Pacific, and at our friend Tom's farm. Have a comment or a question? Great! Send me an email! It has been said (by Albert Einstein, no less) that "If bees disappeared completely, man would only be able to survive for another four years." Scientists hope that he was exaggerating. Babe, I'm Gonna Leave You.